Based on the quantity of moldering ruins on Artaeum, once there must have been many more Monks of the Psijic Order than are present today. This hall looks to have been abandoned more recently than most. 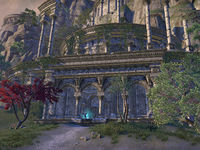 Traitor's Vault is a delve on Artaeum found due west of the Artaeum Wayshrine and portal to Summerset. Explore and clear Traitor's Vault.